In 1227 A.D. Chinggis Khan (Genghis Khan), the "lord of the ocean encircled lands" died. But who was to take his place? Chinggis had left four sons by his principal wife, Borte, and there was no orderly system of succession. Since it was known that Chinggis had favored his son Ogodei, it was he who became the first Khanhan, the first to take the title of Great Khan. With Ogodie's death in 1241, the real succession struggle began. Into the fray stepped royal wives, widows and mothers, each with their own candidates. It was not unusual for such women to play leading roles. The wife of each clan head, usually the first, enjoyed high status and frequently took part in clan affairs. First Ogodei's wife, the widow Toregene, schemed to win the throne for her son, Guyuk. In 1246, Guyuk was crowned, but died after ruling for only two years. His widow, Oghul Qamish, became acting regent for her three young sons - in effect, then, regent for the whole empire. Her sons being too young to rule, her candidate for Great Khan was a nephew, Shiramon. With this decision the Ogodei line faltered and fell, because waiting her turn at khan making was a female more astute than Oghul Qamish. 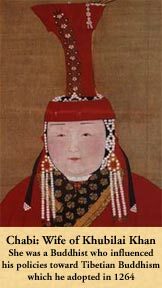 This was Sorghaghtani Beki, widow of Tolui, another of Chinggis' sons. Sorghaghtani held great authority. She was a daughter-in-law of Chinggis Khan and mother of his grown grandsons. Moreover she was a consummate politician who pointed out that future khans ought to be Chinggis' direct descendants, which nephew Shiramon was not. The powerful nobles quickly sided with Sorghaghtani against Oghul, and Sorghaghtani's eldest son Mongke emerged as victor. He was enthroned in 1251, setting in place the accession of the future rulers of the Mongolian Empire through the Tolui line. For this, Sorghaghtani has been called the "directing spirit of the house of Tolui." Mongke was the last Great Khan to have complete control over the vast Mongol Empire. Upon his death, only eight years later, another of Sorghaghtani's sons - Khubilai (Kubla) Khan- became Great Khan. It was he who launched assaults against China and eventually ruled all of that empire, establishing the Mongol Yuan dynasty (1272-1368). Another influential son, Hulagu, was sent west to capture Persia, Baghdad and the Middle East. In 1253 he established the Mongol Ilkhanate, which governed Persia and parts of the middle east. Throughout the years of her son's rule, the influence and teaching of Sorghaghtani was felt. She had ensured that her sons received proper training and the skills in combat and administration necessary to rule empires. Although she herself was illiterate, she gave them an education. She set an example for them in showing the good results that can come from supporting rather than exploiting the non-Mongol peasants in the lands she controlled. Understanding what Khubilai Khan would need to rule China, she introduced him to the concepts of Confucian thought. It was because of Sorghaghtani that her sons all became known for their religious tolerance. Sorghaghtani was a Nestorian Christian who patronized a variety of foreign religions. For example, she supported Islam with alms. Buddhists and Confucainists were also supported. When Khubilai Khan was in China, it was his mother's Christian faith that prompted him to assist the small Nestorian community there. He also recruited numerous Muslims for his government, and through the influence of his wife Chabi courted even the Song imperial family rather than destroy and discredit them. Hulagu married Doquez-khatum, a Nestorian princess like his mother. When Hulagu sacked Baghdad, Doquez-khatum interceded to save the lives of all the Christians. Hulagu's brother Mongke was impressed. "You would do well to consult her in all his affairs," he told Hulagu. To please his wife, Hulagu favored the Christians, and all over his realm new churches sprung up. In future generations in Persia under the Mongol Ilkhanate, a number of royal women surfaced who not only played active roles in decision-making, but who sometimes ruled. Here too, the name of Sorghaghtani Beki, mother of the Great Khans, was known; she was described by one Persian historian as "extremely intelligent and able," and as "towering above all the women in the world." To learn why women in Mongolia commanded decision-making authority, click here.